Nerve injuries from injections are fairly common occurrence in medical practice, although their exact incidence remains unknown. Many procedures, including intravenous line placement, joint aspiration, nerve block, phlebotomy and intramuscular (IM) injections place patients at risk of the injection injury. Common nerves reported undergoing nerve injection injury (NII) includes sciatic, radial, axillary, ulnar, median, tibial and peroneal nerves. NII occurs through several mechanisms that can be conceptually simplified into direct injury from the needle itself or indirect injury from the substance injected. Examples of direct injury include trauma caused by beveled needle tips aligned perpendicularly to the nerve and high-pressure injury caused by inappropriately smaller gauge and large bore syringe barrels. Examples of chemical injury include direct neurotoxicity caused by a wide variety of medications, ischemic nerve damage caused by steroids and vasoconstrictors, and myelin damage often caused by local anesthetics  . The buttock and the shoulder serve as the most predominant targets of IM injections, with the buttock being the most common. Thus, it is unsurprising that the sciatic nerve is the most commonly affected nerve. Causation of direct injury can be broadly categorized into two classes, the first being an incorrectly placed needle damaging a normal nerve and the second being a correctly placed needle causing damage in the nerve at an anatomically variant location. Injuries attributable to anatomic variation are exceedingly rare. Subsequently, the most important factor in preventing NII is the knowledge and experience of the individual placing the needle  . 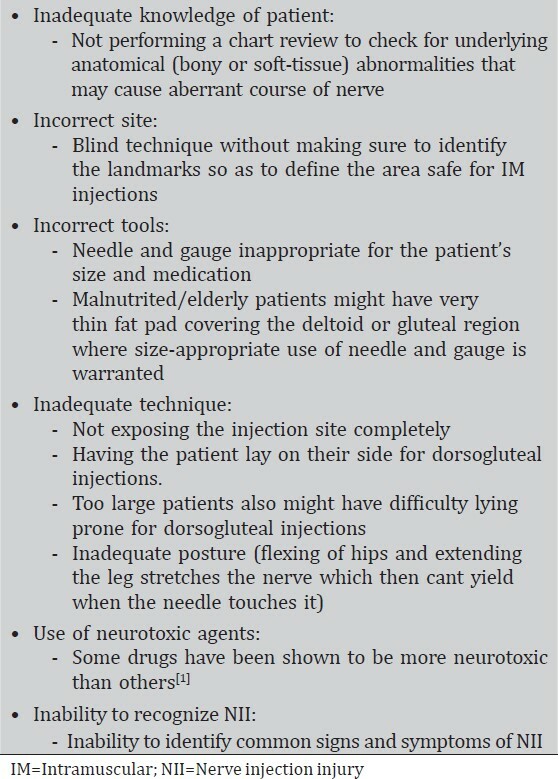 Some of the common mistakes made by medical practitioners while administering IM injections and cautions that should be taken to prevent NII are enumerated in [Table 1]. In this article, we aim to guide students and other medical practitioners in proper IM injection technique as well as provide them with the tools needed to recognize and appropriately treat potential nerve injury. The deltoid is a triangular-shaped muscle forming the rounded contour of the shoulder, with three points of origination, the lateral third of the clavicle, the acromion, and the posterior border of the spine of the scapula. It inserts into the deltoid tuberosity on the lateral shaft of the humerus  . To locate the injection site, expose the shoulder and arm and identify the landmarks-acromion and deltoid tuberosity [Figure 1]. Palpate the acromion process by following the clavicle laterally where it articulates with the acromion at the acromio-clavicular joint. The deltoid tuberosity can be identified in the middle of the antero-lateral surface of the humerus where the deltoid tapers into it. Imagine an inverted triangle with its base just below the acromion process and opposite the tip of the triangle just above the deltoid tuberosity. Select a spot for injection in the middle of the triangle, about halfway between the base and tip of the triangle, stretch the skin, bunch up the muscle mass and inject at 90° to the skin surface  . Perhaps the most difficult aspect of injecting the deltoid involves the selection of appropriate needle length. The lengths suggested for use in children range from 16 to 32 mm depending on the age and size of the child. 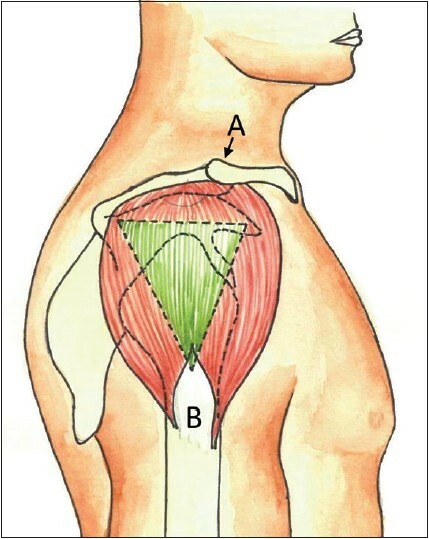 Note that the depth of connective tissue over the deltoid remains relatively consistent (~5 mm) in adolescents regardless of the individual's body-weight  . In adults, the suggested range is 25-38 mm, again depending on patient size, with larger patients requiring longer needles. Very few complications have been reported with use of this site. A major limitation of this technique is the small size of its target area, which limits the number and volume of injections that can be administered  . There is much debate in the literature over which technique is the best for IM injections of the gluteus  . Here we describe the two most common methods used. The first method involves injection in to the dorsogluteal site  . To perform this injection, have the patient lay prone with toes pointed inward to relax the gluteal muscle. Next, visualize an imaginary cross separating either the left or right buttock into four quadrants [Figure 2]. Then select a site in the middle of the upper outer quadrant, stretch the skin and inject perpendicular to the skin. The goal of this relatively simple technique is to inject into the gluteus maximus, although some authors think that it targets the gluteus medius , . Pitfalls of this technique include attempting to inject too superiorly resulting in needle contact with bone or injecting too close to the central point of the cross potentially hitting the sciatic nerve. A common mistake made by many practitioners is that of having the patient lay on their side rather than in a prone position. This alters the appropriate visualization of the cross, resulting in increased frequency of misplaced injections. The second technique for gluteal injection targets the ventrogluteal site  . To do this we may have the patient lay supine or in a lateral position. Landmarks that need to be identified are-greater trochanter of the femur, iliac crest and the anterior superior iliac spine (ASIS) as shown in [Figure 3]. The greater trochanter of the femur can be palpated as a solid structure at the supero-lateral portion of the femur, lying a hand's breadth below the tubercle of iliac crest and forming a wide prominence just in front of the hollow of the side of the hip. The iliac crest can be palpated as a broad convex bony ridge lying below the waist and forming the upper end of the ilium, anteriorly ending as the ASIS. The palm of your opposing hand (i.e. right hand for left hip injection) is placed on the greater trochanter. The index finger is placed on the ASIS and the middle finger is extended palpating the iliac crest towards the iliac tubercle, at the widest portion of the iliac crest and located approximately 5 cm posterior to the ASIS. The middle finger and index finger should be separated as widely as possible and skin stretched in between ,, . The needle should then be inserted at an angle of 90° to the skin in the middle of the triangle formed between the middle and index fingers and the imaginary line joining the finger-tips. If performed correctly, the target of this technique, the gluteus medius, will sit between the index and middle fingers. Though more difficult to perform, this technique has a much lower complication rate as this site is free of major nerves and vessels. Injections can be given in the ventrogluteal site in supine, prone or side lying position without the fear of damaging the sciatic nerve  . There are some notable problems with both types of intragluteal injections. A significant drawback to using this site for IM injection is the large variability of depth in the subcutaneous layer. In adults this has been reported to vary from 1 to 9 cm. The problem is present in infants as well as their gluteal muscles are undeveloped making this area consist primarily of fat  . It is likely that for this reason, the most common error in gluteal IM injection is depositing the injected substance in fat. This error leads to poor absorption of the chemical, especially if it is not lipid soluble. Several authors have suggested that the volume of drug injected might play a role in nerve injury  but there is no consensus regarding the safe volume of the substance that can be injected in the gluteal mass. The maximum suggested volume varies by source, with a range of 3-5 ml ,, . In order to timely treat injection nerve injury a competent healthcare professional must first be able to recognize it. In most cases of NII, patients present with paresthesia, a sharp stabbing pain, at the time of injection , , followed shortly by neurosensory loss along the peripheral nerve distribution and weakness of the muscles innervated by the nerve. It should be noted that there is much variation in presentation; some patients can solely have numbness while others may only experience mild weakness or pain. In addition, the timing of these symptoms is hard to pin down as some patients report a delayed presentation hours or days after injection ,, . Therefore, any pain, sensation loss, or weakness along a nerve distribution with a recent history of injection should raise a suspicion of NII. Specific signs to watch out with gluteal injections include those of damage to the sciatic nerve. Depending on how severely the sciatic nerve is injured a patient may present with impaired knee flexion, loss of dorsi-and plantar-flexion of foot, loss of functions of posterior tibialis, foot invertors and peroneus longus and brevis foot evertors, and sensory loss to posterior thigh, lower lateral leg and complete foot  . In the case of deltoid injections, axillary nerve (AN) and radial nerve (RN) have the potential for injury. The AN lies beneath the deltoid at the surgical head of the humerus. Injections placed too deeply risk damage of this nerve. Signs suggestive of AN injury, include impaired shoulder abduction and sensory loss over the deltoid, the so-called regiment badge sign. The RN lies below the scapular portion of the deltoid, that means an injection misplaced postero-inferiorly can cause damage to this nerve. Depending on the degree of insult, signs suggestive of RN injury include loss of forearm extension, weakness of supination, loss of hand and finger extension, leading to a characteristic wrist drop, and sensory loss in the lateral arm, posterior forearm, radial half of dorsum of the hand except the little and ring fingers and the nail beds. The treatment of injection nerve injury is another topic of debate in the literature. The current consensus is that if the symptoms are mild, that is, complaints of pain or numbness without loss of motor function, the treatment team should provide at least 3-6 months of conservative therapy before subjecting the patient to more invasive techniques ,,, . Conservative measures include providing the patient with non-opioid analgesics like ibuprofen, drugs for neuropathic pain like gabapentin and carbamazepine, and physiotherapy. During this time the patient should be followed closely by his or her provider with regularly scheduled exams and electromyograms to track the recovery process and modify the treatment plan if needed. The vast majority of injection nerve injuries will heal on their own in this time frame. If the patient does not have clinical or electrophysiological improvement in 3-6 months or they have severe pain or motor function loss on initial presentation, immediate referral to a peripheral nerve surgeon is called for, as prompt surgical treatment is their best option for recovery. Intramuscular injections are a frequently performed and often overlooked cause of iatrogenic nerve injury. Complications can often be obviated by understanding the anatomy underlying the injection site and knowing the proper technique for injection administration. It is critical that the individual performing the procedure be able to recognize the signs of nerve injury, provide basic care, and know when to refer the injured patient to a specialist. We thank Ms. Sneha Prateek for making the figures. VH conceptualized the project. JB and VH contributed to literature search, project design and drafting the manuscript. JB, VH and SP edited and critically revised the paper. All authors have read and approved the final version of the manuscript. Barry JM, Harsh V, Kumar A, Patil S. Injection nerve palsy: what's to blame? J Neurosci Rural Pract 2013;4(4):481. Karakaya D, Baris S, Güldogus F, et. al. Brachial plexus injury during subclavian vein catheterization for hemodialysis. J Clin Anesth 2000;12(3):220-3. Bergeson PS, Singer SA, Kaplan AM. Intramuscular injections in children. Pediatrics 1982;70(6):944-8. Beyea SC, Nicoll LH. Administration of medications via the intramuscular route: an integrative review of the literature and research-based protocol for the procedure. Appl Nurs Res 1995;8(1):23-33. Groswasser J, Kahn A, Bouche B, et. al. Needle length and injection technique for efficient intramuscular vaccine delivery in infants and children evaluated through an ultrasonographic determination of subcutaneous and muscle layer thickness. Pediatrics 1997;100(3):400-3. Engstrom JL, Giglio NN, Takacs SM, Ellis MC, Cherwenka DI. Procedures used to prepare and administer intramuscular injections: a study of infertility nurses. J Obstet Gynecol Neonatal Nurs 2000;29(2):159-68. Harmer B, Henderson V. Textbook of the Principles and Practice of Nursing. 4 th ed. New York: Macmillan; 1939. Dugas B, Esson L, Ronaldson S. Nursing Foundations: a Canadian Perspective. Scarborough: Prentice; 1999. Gilsenan I. A practical guide to giving injections. Nurs Times 2000;96(33):43-4. Von Hochstetter A. The intragluteal injection, Its complications and their prevention. Schweiz Med Wochenschr 1954;84(43):1226-7. Mishra P, Stringer MD. Sciatic nerve injury from intramuscular injection: a persistent and global problem. Int J Clin Pract 2010;64(11):1573-9. Zelman S. Notes on techniques of intramuscular injection. The avoidance of needless pain and morbidity. Am J Med Sci 1961;241(5):563-74. Brandt PA, Smith ME, Ashburn SS, Graves J. IM injections in children. Am J Nurs 1972;72(8):1402-6. Kozier B, Erb G, Berman AJ, Burke K. Fundamentals of Nursing: concepts, Process, and Practice. 6 th ed. Prentice Hall Health in Upper Saddle River, New Jersey: prentice Hall Health; 2000. Lachman E. Applied anatomy of intragluteal injections. Am Surg 1963;29(3):236-41. Gentili F, Hudson AR, Hunter D. Clinical and experimental aspects of injection injuries of peripheral nerves. Can J Neurol Sci 1980;7(2):143-51. Ross Kerr JC, Wood MJ. Canadian Fundamentals of Nursing. 2 nd ed. Toronto: Mosby; 2001. Craven RF, Hirnle CJ. Fundamentals of Nursing: Human Health and Function. Philadelphia: lippincott, Williams Wilkins; 2003. Rodger MA, King L. Drawing up and administering intramuscular injections: a review of the literature. J Adv Nurs 2000;31(3):574-82. Lee JB, Choi SS, Ahn EH, et. al. Effect of perioperative perineural injection of dexamethasone and bupivacaine on a rat spared nerve injury model. Korean J Pain 2010;23(3):166-71. Spinner RJ, Kline DG. Surgery for peripheral nerve and brachial plexus injuries or other nerve lesions. Muscle Nerve 2000;23(5):680-95. Maqbool W, Sheikh S, Ahmed A. Clinical, electrophysiological, and prognostic study of postinjection sciatic nerve injury: an avoidable cause of loss of limb in the peripheral medical service. Ann Indian Acad Neurol 2009;12(2):116-9. Midha R, Guha A, Gentili F, Kline DG, Hudson AR. Peripheral Nerve Injection Injury. Philadelphia: WB Saunders; 1999. Pandian JD, Bose S, Daniel V, Singh Y, Abraham AP. Nerve injuries following intramuscular injections: a clinical and neurophysiological study from Northwest India. J Peripher Nerv Syst 2006;11(2):165-71. Kim DH, Murovic JA, Tiel R, Kline DG. Management and outcomes in 353 surgically treated sciatic nerve lesions. J Neurosurg 2004;101(1):8-17. Senes FM, Campus R, Becchetti F, Catena N. Sciatic nerve injection palsy in the child: early microsurgical treatment and long-term results. Microsurgery 2009;29(6):443-8. Wood MB. Peroneal nerve repair. Surgical results. Clin Orthop Relat Res 1991:267(1):206-10. Gilles FH, Matson DD. Sciatic nerve injury following misplaced gluteal injection. J Pediatr 1970;76(2):247-54.